How To Maintain Your COD Productivity System On A Day To Day Basis. The top reason people stop using a productivity system is over-complexity. If your carefully crafted system makes it hard to collect stuff, and you have a complex organisational structure that takes too much time to maintain, you are going to stray from the productivity road. 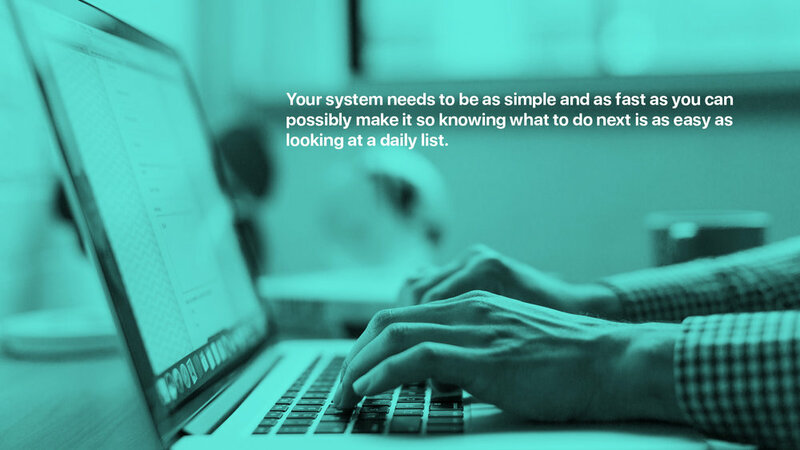 Your system needs to be as simple and as fast as you can possibly make it so knowing what to do next is as simple as looking at a daily list. If it takes more than ten minutes to organise the stuff you collected throughout the day your system is too complex. You need to be able to ask: “what is it?” And “what needs to happen next to complete it?” And know immediately what to do. If you find yourself having to think too much about where something should go, your system has too many levels. If you can look at something you collected and within a few seconds have it filed where it should go, then you are well on the way to making your system work. Go back to basic principles. One of the best ways to simplify your system is to start with the basics. Notes can be filed under simple headings. Work and Personal. Most note-taking apps will allow you to create folders or notebooks in order to create some form of organisation. From there you can decide how to make it easy to find the note you are looking for. Understanding how you think when you search for something can be a big help here. For me, if I want to find something related to James Bond, I have a tag called James Bond in Evernote. This means All I have to do is search for James Bond and I will be presented with a small list of related tags. James Bond — Films, James Bond — Cars, James Bond — Clothing and James Bond — Accessories. Now that’s just the way I think. You will think differently and you should create a search strategy that reflects your thinking. It is a mistake to look at someone else’s organisation structure and think that would work for you. The chances are it will not. You think differently and you are going to have different types of things to file and keep. Create a file system that reflects the way you think and the way you work. Keep your to-do lists simple. The same basic principles work with your to-do list manager. Too often I see people creating very complex structures that involve multiple levels of projects and sub-projects. The question is do you really need that many levels of structure? To-do list managers only need to tell you what needs doing next and when. If you spend too much time going through multiple levels of projects, tasks and sub-tasks just to find what to work on you are not only wasting time, you are also going to get dragged off into places you really should not be spending time in. At a very basic level, you only need a list of active projects or areas of focus — depending on which works best for you — and have these organised so the tasks that need doing pop up in a daily list when they need doing. You don’t need different hierarchies of child and parent projects, start and due dates or snooze and hide functions. It is a good idea to have these tasks organised into simple projects or areas of focus so you can review them when necessary. But the purpose of a to-do list manager is to tell you what needs doing next so you can be focused on the important and keep away from the unimportant. A good setup means you are doing the important work, not looking for the unimportant work. A good system shows you what needs doing next with as little fuss and mess as possible and is very easy to maintain. It’s about doing the work, not reorganising your tasks. you have your system working properly, you will be doing the important work you have set for yourself and collecting your commitments, tasks, events and notes throughout the day. You should not be spending much time inside your to-do list manager at all. Your calendar will be telling where you need to be and when your to-do list manager will be telling what to work on and your notes app will be giving you all the necessary information when you need it. It’s ninety-five per cent doing the work that matters and five per cent maintaining your system. When you reach that ratio consistently you will know you have the right system. Take ten minutes to plan each day. At the end of the day, you take ten minutes to organise everything you collected that day into its rightful place, make a decision on what two objectives you will complete tomorrow and what eight things you would like to focus on. And that’s it. Turn off, enjoy your life and be relaxed knowing you have the next day planned and will be able to start the day off supercharged and ready to get your most important work done. Being better organised and more productive does not have to be difficult. It certainly doesn’t need overly complex structures. You need to know what’s important, what needs to be done and where you need to be. Anything else is just adding more complexity. When you remove those levels of complexity and focus on simplicity you will find you get a lot more of the important stuff done and when that happens you can spend more time doing the things you want to do, like spending more time with your friends and family, enjoying time to appreciate the amazing nature around you and feeling a lot less stressed. If you want to know more about COD (Collect, Organise and Do) then you can read last week’s blog post here, where I go into detail about how this system works. I have also put together a FREE online course right here that will take you through the basics of setting up your own COD system and if you are in the Todoist community, I have a YouTube video here that explains how to set up a COD system in Todoist. Being better organised and more productive does not have to be difficult. It just takes a decision and a couple of hours to set up and you too can start focusing on doing work that matters and being much less stressed.